Dr Clarke did his medical training in England at the University of Leicester and undertook clinical radiology training at Nottingham. He completed a fellowship in Gastrointestinal (GI) and Hepatobiliary (HPB) imaging at Leeds Teaching Hospitals. He is currently a consultant radiologist at Nottingham University Hospitals NHS Trust (UK) specialising in gastrointestinal, hepatobiliary and emergency imaging with general intervention. He is proficient in ultrasound, fluoroscopy, CT and MRI imaging, with expertise in proctography, bowel imaging, CT colonography and liver MRI. He also performs image guided 'pinhole' surgery including biopsies, short and long-term drains, gastrostomies, tunneled central line and portacath insertions, and oesophageal, duodenal and colonic stenting. He is a fellow of the Royal College of Radiologists (RCR) and registered with the General Medical Council. He is a member of the British Society of Gastrointestinal and Abdominal Radiology (BSGAR) and sits as a member of the online editorial board for the European Society of Gastrointestinal and Abdominal Radiology (ESGAR). He enjoys web development and graphic design, and is keen to help trainees get the most out of clinical radiology training. 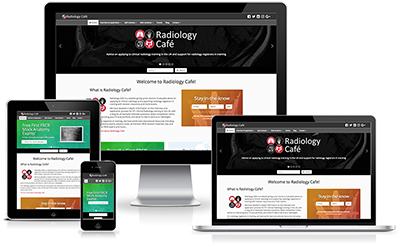 He founded Radiology Cafe in April 2011 and is currently the lead developer and editor-in-chief. He works hard to ensure accurate and excellent content throughout the site. He developed the First FRCR anatomy mock exams, producing 1800 free questions to help radiology trainees. He is also co-author of FRCR Physics Notes along with Dr Sarah Abdulla, developing and optimising many of the diagrams on the website. In 2018 he founded Radiology Cafe Publishing and published FRCR Physics Notes: Beautiful revision notes for the First FRCR Physics exam on Kindle. He is currently working on a few other projects including a paperback version of the FRCR physics books and mock Rapid Reporting exams on this website. 1st author, 140 pages, published in 2011. Further information and sample pages. Follow on facebook.com/chestxrays . 1st author, 121 pages, published in 2015. Highly commended at the 2016 BMA Medical Book Awards. Further information and sample pages. Follow on facebook.com/abdominalxrays . Co-author, 477 pages, published in 2018. Further information. Follow on facebook.com/FRCRphysicsnotes .